You can access "Private drive" app by navigating to http://tracksw.com/trackpriv/. In login screen, enter device ID of your vehicle and password. Private Drive app is very simple: it has only one button, with which you can switch private drive on/off. 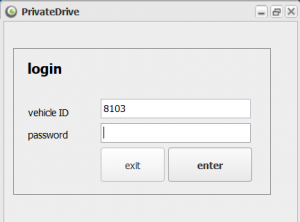 When private drive is activated, vehicle's current location will not be seen in TrackSW software's current devices tab or history. However, the distance travelled will still be calculated and can be seen in the report. When private drive is off, the tracker and software will operate as usual. Distance travelled (in kilometers) can be seen in Daily statistics report (click on image on the right to enlarge).